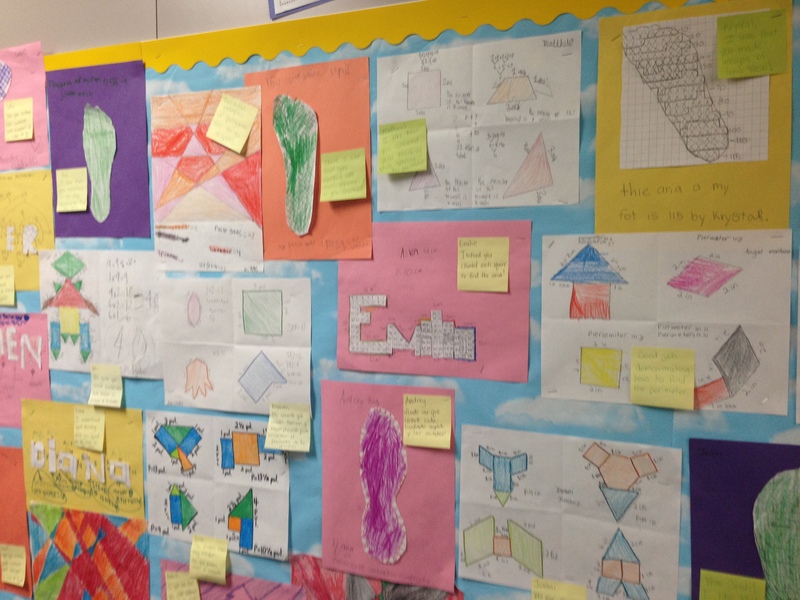 What do you notice about the two displays of student work? Any similarities? any differences? The biggest thing that stuck out to me was that in Exhibit A, all of the student work looked exactly the same. I know you can’t read the text under each elephant, but it too was essentially the same on every page. I will disclose that Exhibit A was done by kindergarteners and Exhibit B was done by second graders, but still. 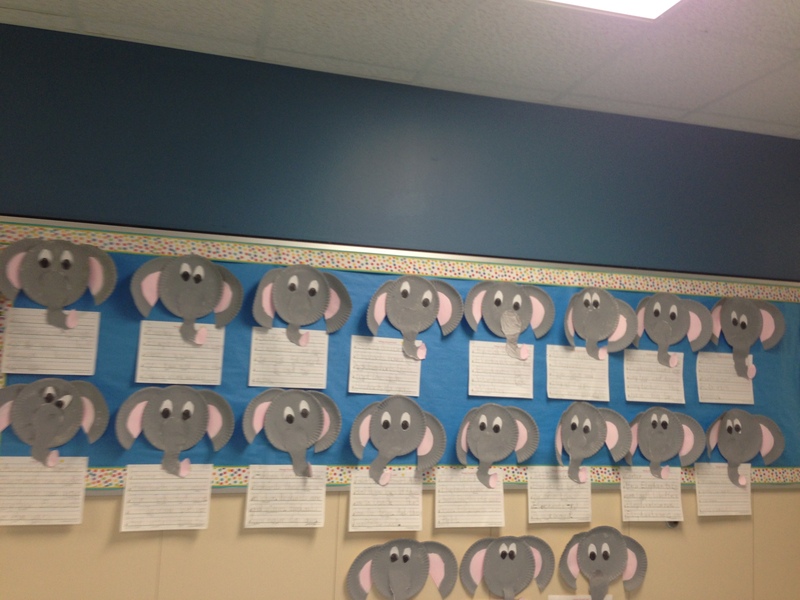 Are you honestly telling me that kindergarteners, if given the opportunity, wouldn’t have come up with a more creative way to demonstrate their understanding about elephants? Another question I had was what do the state standards say about elephants specifically? Does everyone have to learn about elephants? (The answer to that is NO!) What if a student wanted to learn about monkeys instead? Clearly, in this scenario, students were not given the choice in deciding what they would study. Now, look at Exhibit B. If you can’t tell, the students are learning about perimeter and area. Some of the students chose to demonstrate their understanding of perimeter and area by marking off their foot print while others wrote out their names in block letters and then calculated the perimeter and area of their names. In this case, students had choice about how they would demonstrate mastery of the skill being taught. Think about it this way, if the work in the pictures above were a depiction of work in say a high school English classroom, I would equate Exhibit A to the whole class novel where everyone has to read the same book and write the same essay over the same prompt. Whereas, Exhibit B would be reflective of the work that my co-blogger and friend Amy has been writing about in her posts lately as she has empowered her students to read whatever books they want. Amy hasn’t given up the content and the standards she has to teach. She has just allowed the students choice in what they read and how they show their understanding of that content and the skills they have learned. What about in your own classroom? Is there anything that you ask students to do that looks more like Exhibit A than Exhibit B? How might you change or modify the assignments to allow students a choice on how they want to demonstrate understanding of a particular topic? I know, two reblogs in one week. I just had to pass this along. This is near and dear to my heart. Whenever I work with teachers I talk about the implicit messages and limitations some practices have on kids. This post is a MUST read. When I saw the first picture, I cringed. I was thinking that you were about to praise the elephants and I was deciding how to approach the post. THANK YOU for standing up for those kindergarteners’ creativity. The masterpieces that my little 3 and 4 year olds create are beautiful. We have a workshop in our school with all sorts of materials that they are always eager to create things related to their learning or just for fun. Their detailed plans and beautiful constantly amaze me. It makes me so sad to see those elephants all standing in a row, exactly the same.